The Kree are a race of aliens that were carving an interstellar empire at a time when the first mammals had appeared on Earth. The Kree are naturally blue-skinned, though a paleskinned mutation has flourished to the point that the original Kree are a powerful minority. Kree possess extremely powerful technology including interstellar drive and genetic manipulation devices, but not time travel. They are responsible for the Terran Inhuman race and the Blue Area of the Moon. They have created powerful robotic Sentries that act as recorders and protectors of their installation. They have interest in Earth not only for its native races, but for its location near a natural space warp nexus and advantageous position in regard to the Skrulls. 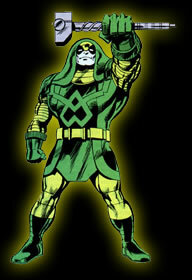 The Kree are ruled by a group organism made up of the minds of past rulers, called the Supreme Intelligence. Like the Kree themselves, the Supreme Intelligence seems limited in imagination, and the development of the Kree race has hit its apex. Popularity: -10 on Skrull worlds/0 on other worlds. Weakness: Blue-skinned Kree cannot breath Earth's atmosphere unaided and are -1CS on all Ability ranks and powers. (Health and Karma are affectted in proportion) They also have -2CS on all Ability and Power FEATs for as long as they breathe Earth's atmosphere unaided.